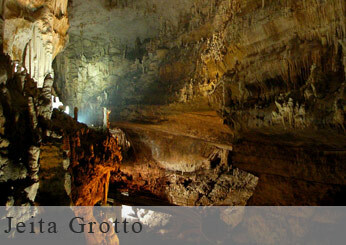 Discovered in 1836 Jeita Grotto, a unique natural wonder extending for more than 6 kms consists of two galleries, an upper level that can be visited on foot and a lower level that can be visited by boat. Take a short cable car ride to the upper gallery admiring the lush green vegetation covering the mountain walls along the way. Back down, a short walk will bring you to the entrance of the lower gallery where boats will take you into the bowels of the mountains. Huge stalactites and stalagmites created by both water and time are dramatically illuminated revealing their unusual shapes to marvel at. Jeita Grotto was an official finalist candidate selected among 28 natural landmarks worldwide qualifying from over 440 participants in the final phase of the New 7 Wonders of Nature in 2011”. Possible for elderly and assisted persons. Toilets available at Jeita Grotto.